Operation Eat Everything in Stock is in full gear. Two weeks from Monday, our movers will be here and I’d like to waste nothing. I’m not sure that’s possible, but as far as the freezer goes, I have a list of all that remains and I’m making my way through it…all of it, let’s hope. When I was assigned this recipe for the “Noodle” themed recipe swap, I had two thoughts. First, I recognized that I had every ingredient on hand. This was a serious bonus given the imminent move. Second, I doubted that this recipe had enough “oomph” (shall we call that flavor?) to win me over. Soy sauce, broth, and red pepper flakes….it certainly doesn’t get more simple than that. I should have never doubted Mary Ellen’s pick for the recipe swap. I mean, if it was memorable enough for her to hand-pick to share with others, of course it was good! So, I’ll save you any questions. Rest assured, this is delicious. I added in the edamame because, well, I had 6 partial bags to use…and I thought they would add nice color and texture. Which it did. Line a baking sheet with parchment and mist with olive oil. Arrange tofu on baking sheet, misting with olive oil to coat. Season with salt and pepper, if desired. Bake for 25-30 minutes or until lightly browned. Meanwhile, bring a small pot of water to boil. Add the rice noodles and cook for 6-8 minutes, until al dente. Drain, rinse with cold water, and set aside. 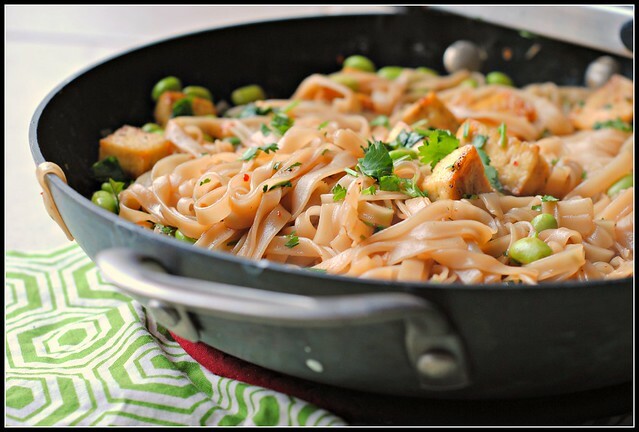 Heat the olive and sesame oil in a large saute pan or wok over medium-high heat. Add the garlic; saute 1-2 minutes Add the noodles and toss for just a few seconds. Add the soy sauce, broth, and red pepper flakes and toss. 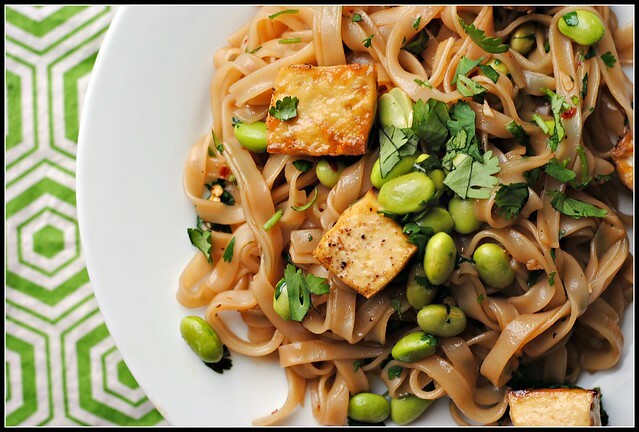 Stir in the tofu, edamame, and cilantro. Serve hot with additional cilantro, if desired. 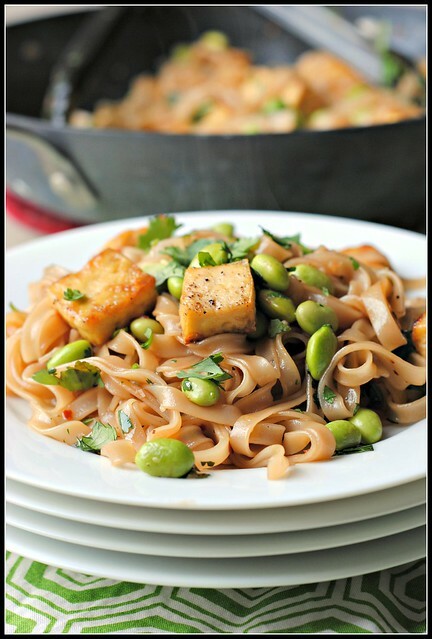 Result: I added the tofu and edamame, and therefore upped the sauce ingredients a bit (changes made in recipe above). I also used closer to 1 teaspoon of red pepper flakes as we love the heat. 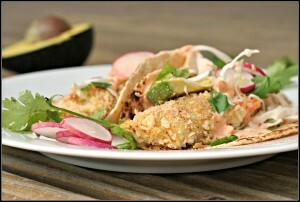 This meal was quick and easy to throw together, and you certainly sub in any protein of your choice. 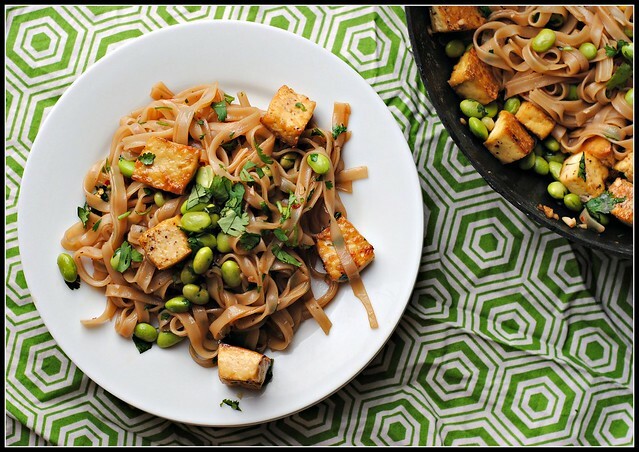 I like the idea of rice noodles to keep this meal gluten-free, and the soy offers up nearly 22 grams of vegetarian protein which is pretty impressive…and delicious! Mr. Prevention-approved…he really enjoyed this meal (and no whines about the tofu, either!)! Yesterday was my last day of teaching…bittersweet! Unfortunately, I won’t be “done” until I finish grading a stack of assignments. I will DEFINITELY not miss grading…ugh. Four day work weeks move at a pace I could get used to! Not sure what’s on the weekend agenda other than a couples massage on Saturday, but I’m looking forward to that! 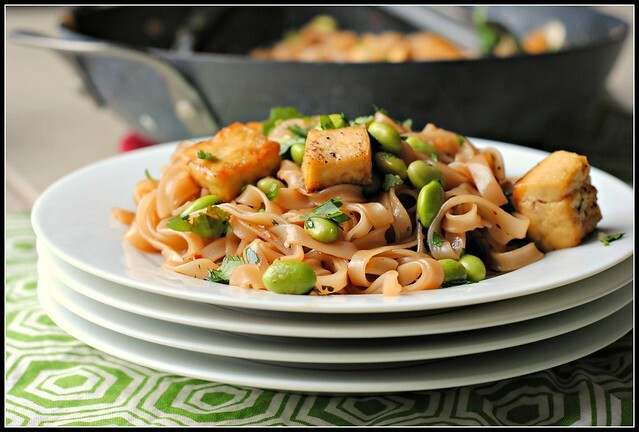 I love your additions of edamame and tofu! I also do the same thing with bags of veggies in the freezer… I definitely agree with your reasoning – too lazy to check the freezer when making that shopping list! Such beautiful photography! Good luck with emptying the freezer! This sounds delish! And the edamame definitely added nice color!! This looks so delicious! This is the kind of dish that I would completely devour! I am like that with bags of french fries – last time I checked I had five different kinds opened at once! Looks delicious – now that I can find edamame, I’ll have to put this on the list of things to make. Happy Friday! I love simple recipes like this. Sesame oil can add such a bang of flavor. This looks great! A noodle themed exchange sounds right up my alley. Thank you, dear 🙂 Very excited to see you at the picnic!! I have every ingredient except the noodles on hand (but I do have regular noodles! )… love when that happens. Enjoy your massage this weekend! This looks so good. I always have an abundance of edamame in my freezer too. This sounds so good. I love the additions you made. Definitely putting it on the list. Looking Fantastic..perfect dish for have. !! 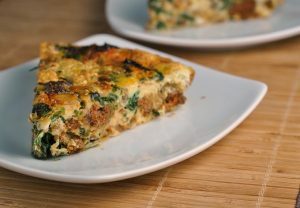 Made this recipe this week, and it was a great veggie option. Even the tofu skeptical husband gave it the thumbs up. Thanks! I’m so glad you enjoyed it! 🙂 Hubby, too!